Chemical sedimentary rocks are weathered. They are formed from rocks just like the clastic ones. However, the rock material they are formed from has been weathered chemically, not physically as in clastic sedimentary rocks. 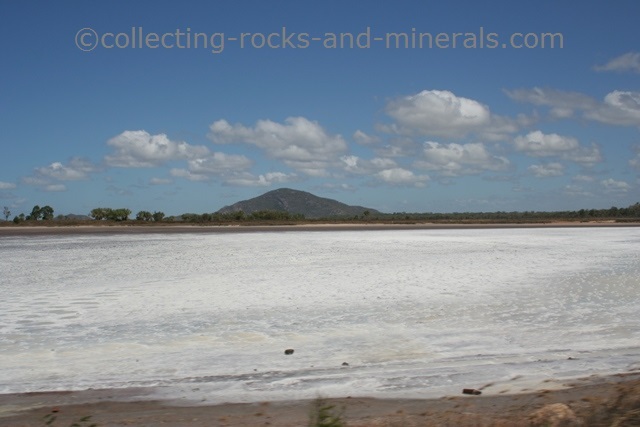 Rock salt is an evaporite, meaning it forms when the water evaporates from a water body. It is familiar as common table salt, and it is formed from the water-soluble mineral halite. It is usually colourless to orange, but rarely blue in colour. Different colours result from impurities of clay minerals and iron oxides. It is usually massive but sometimes forms cubic crystals. 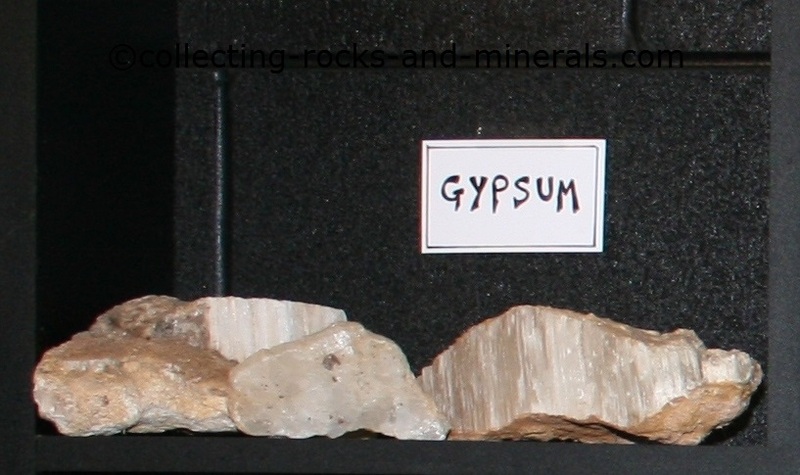 Rock gypsum is another evaporite. It forms in evaporite rock sequences in association of minerals such as calcite, halite and anhydrate; and rocks such as marl and dolomite. It can occur in massive white layers, or banded in light colours. It is often massive or fibrous. It is very soft - you can scratch it with a fingernail. 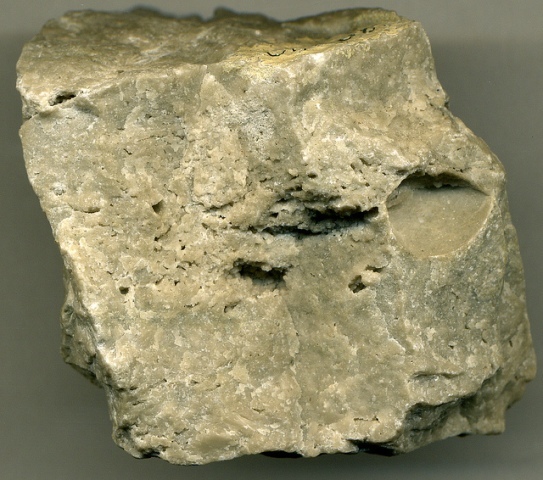 Dolostone is also known as dolomite, although that name is confusing due to the mineral dolomite which it consists of. It looks much like limestone, however it does not react with HCl unless finely powdered. It is also darker, has less fossils, and has got more crystalline material. Apart from dolomite, it contains quartz, feldspars and mica, and secondary silicates. 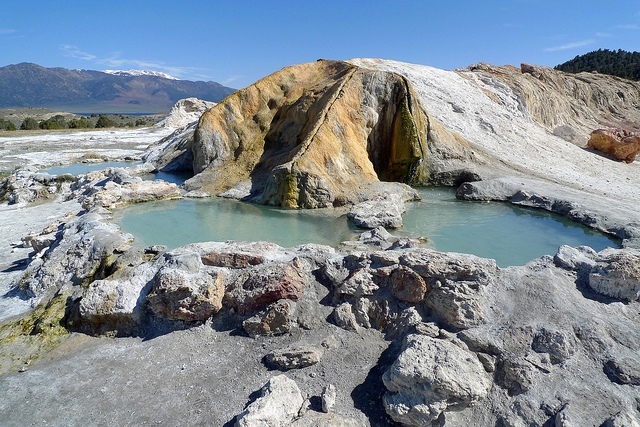 Travertine is the product of hot springs. While some books state it can also occur as stalactities and stalagmites in limestone caves, others list stalactite as a rock on its own. It is almost pure calcium carbonate and can contain minor amounts of quartz and clay minerals. It is creamy white in colour unless it is strained by impurities such as metal salts. It is botryoidal, rounded or banded and it lacks fossils. 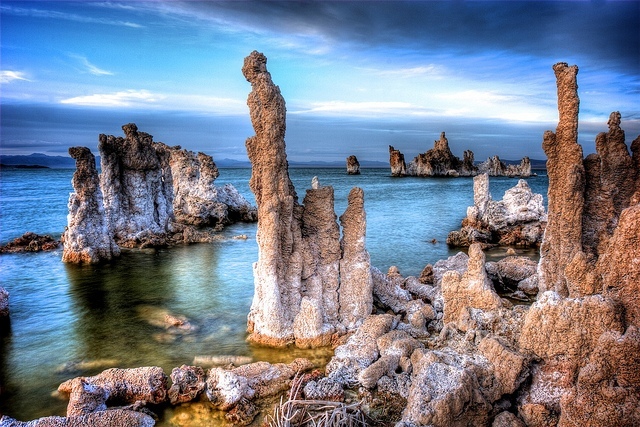 Tufa rock is, just like travertine, one of the chemical sedimentary rocks mainly composed of calcium carbonate. It grows out of lime-rich water when calcium carbonate is precipitated. It is normally white-ish in colour, but can be trained by iron oxides. It is soft, porous and poorly cemented. It is not bedded and it can grow very quickly in favourable conditions.